Christopher Stasheff (15 January 1944 – 10 June 2018) was an American science fiction author and fantasy author whose novels include The Warlock in Spite of Himself (1969) and Her Majesty's Wizard (1986). He had a doctorate in Theatre and taught radio and television at Eastern New Mexico University in Portales, New Mexico; he retired in 2009 and moved to Champaign, Illinois. Stasheff has been noted for his blending of science fiction and fantasy, as seen in his Warlock series, which placed an "'epic fantasy' in a science fictional frame". Stasheff's writing is often seen in the moral and ethical mentor style similar to Terry Goodkind, Terry Brooks or J.R.R. Tolkien. ^ "Christopher Stasheff". Worlds Without End. Retrieved June 13, 2018. ^ "Author Christopher Stasheff Succumbs To Parkinson's Disease". June 11, 2018. Retrieved June 13, 2018. ^ "Williamson lectureship set". The Portales News-Tribune. March 30, 2008. pp. Section State and Regional News. Also speaking at the lectureship is Christopher Stasheff, associate professor of communication at ENMU...Stasheff's work includes the "Warlock of Gramarye" series, "Rogue Wizard" and the novel "Saint Vidicon to the Rescue." He has also contributed to series such as "Wing Commander 'End Run'" and "Mage Knight Stolen Prophecy." ^ "Real Men Don't Wait for the Movie". Aberdeen American News. November 26, 2003. p. 4a. But there are lots of books that have exactly the type of male heroes we ought to emulate..."The Warlock in Spite of Himself" (and its many sequels) by Christopher Stasheff...gives us insight into every stage of marriage from courtship, to the raising of children, to the empty nest. ^ Buker, Derek M. (2002). The science fiction and fantasy readers' advisory:the librarian's guide to cyborgs, aliens, and sorcerers. ALA Editions. pp. 82–83. ISBN 978-0-8389-0831-0. ^ Mullen, R. D. (1975). "Review: The Garland Library of Science Fiction". Science Fiction Studies. 2 (3): 288. ^ "Christopher Stasheff, the Soothsayer in Spite of Himself » John C. Wright's Journal". www.scifiwright.com. Retrieved June 13, 2018. ^ "Tonight in T.O.". The Toronto Star. May 6, 1994. pp. ENTERTAINMENT, Pg. F10. I'm reading something that combines the two loves of my life: science fiction and theatre. It's Christopher Stasheff's A Company Of Stars, from his Starship Troupers series. ^ "Cherryh Returns to Old Form". Chicago Sun-Times. February 6, 1994. pp. SHOW, SCIENCE FICTION, Pg. 15, NC. Christopher Stasheff's We Open on Venus...takes his Starship Troupers to a planet that reminds one of a football-mad Texas town. This series is going to stand on Stasheff's knowledge of and love for the theater; so far it stands well. ^ a b "Games People Play; Unconventional Warfare At The Fantasy Fair". The Washington Post. June 27, 1983. pp. Style, B1. Science fiction author Christopher Stasheff ("A Wizard in Bedlam" and "The Warlock Unlocked") gave a lecture on the relationship between science fiction and fantasy gaming. ^ "Literary recycling has its advantages". The Toronto Star. February 4, 1989. pp. MAGAZINE, Pg. M6. Christopher Stasheff's The Warlock Series has now reached nine titles, and The Warlock's Companion...exemplifies the reasons for its longevity. Here it is the faithful cybernetic steed Fess whose adventures are featured in a string of exciting tales, as Stasheff fills in some of the background of his pleasant fantasy realm. Fighting Fantasy is a series of single-player role-playing gamebooks created by Steve Jackson and Ian Livingstone. The first volume in the series was published in paperback by Puffin in 1982. 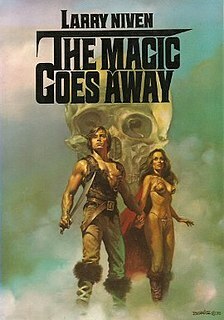 The Magic Goes Away is a fantasy short story written by Larry Niven in 1976, and later expanded to a novella of the same name which was published in 1978. While these works were not the first in the "Magic Universe" or "Warlock" series, they marked a turning point after the 1973 oil crisis and Niven's subsequent transformation of the series into an allegory for a modern-day energy crisis. The setting was later used as a backdrop for a series of full-length novels, The Burning City (2000) and its sequel, Burning Tower (2005), which were co-written with Jerry Pournelle. The "Harold Shea" Stories is a name given to a series of five science fantasy stories by the collaborative team of L. Sprague de Camp and Fletcher Pratt and to its later continuation by de Camp alone, Christopher Stasheff, Holly Lisle, John Maddox Roberts, Roland J. Green, Frieda A. Murray, Tom Wham, and Lawrence Watt-Evans. De Camp and Stasheff collectively oversaw the continuations. The series is also known as the "Enchanter" series, the "Incomplete Enchanter" series or the "Compleat Enchanter" series. 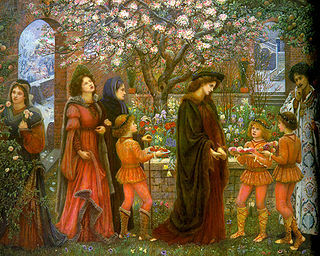 The Castle of Iron is the title of a fantasy novella by American authors L. Sprague de Camp and Fletcher Pratt, and of the novel into which it was later expanded by the same authors. It was the third story in their Harold Shea series. As a 35,000 word novella it was first published in the fantasy magazine Unknown for April, 1941. The revised and expanded novel version was first published in hardcover by Gnome Press in 1950, and in paperback by Pyramid Books in 1962. The book has been reprinted by a number of other publishers since its first appearance. An E-book edition was published by Gollancz's SF Gateway imprint on September 29, 2011 as part of a general release of de Camp's works in electronic form. The novel has been combined with other books in the series in the omnibus editions The Compleat Enchanter (1975), The Complete Compleat Enchanter (1989) and The Mathematics of Magic: The Enchanter Stories of L. Sprague de Camp and Fletcher Pratt (2007). It has also been translated into Italian. The Enchanter Reborn is an anthology of five fantasy short stories edited by American writers L. Sprague de Camp and Christopher Stasheff, the first volume in their continuation of the Harold Shea series by de Camp and Fletcher Pratt. It was first published in paperback by Baen Books in 1992; an ebook edition followed from the same publisher in May 2013. The book has also been translated into Italian. All but one of the pieces are original to the anthology; the exception, de Camp's "Sir Harold and the Gnome King", first appeared in the World Fantasy Convention program book in 1990 and was then published as a separate chapbook in 1991. The Exotic Enchanter is an anthology of four fantasy short stories edited by American writers L. Sprague de Camp and Christopher Stasheff. The Exotic Enchanter is the second volume in the continuation of the Harold Shea series by de Camp and Fletcher Pratt. It was first published in paperback by Baen Books in 1995; an ebook edition followed from the same publisher in September 2013. All the pieces are original to the anthology. The Complete Compleat Enchanter is an omnibus collection of five fantasy stories by Ametican authors L. Sprague de Camp and Fletcher Pratt, gathering material previously published in three volumes as The Incomplete Enchanter (1941), The Castle of Iron (1950), and Wall of Serpents (1960), and represents an expansion of the earlier omnibus The Compleat Enchanter, which contained only the material in the first two volumes. The expanded version also differs from the previous omnibus by omitting its afterword, de Camp's essay "Fletcher and I". The omnibus is the first edition of the authors' Harold Shea series to be complete in one volume. It has appeared under three different titles. It was first published in the UK in paperback by Sphere Books in 1988 under the title The Intrepid Enchanter and with a foreword by Catherine Crook de Camp. The first US edition appeared under the title The Complete Compleat Enchanter, and replaces the foreword with a preface by David Drake. That edition was published by Baen Books in 1989, and has been reprinted a number of times since. Orion Books published an edition in the UK under the title The Compleat Enchanter in 2000 as volume 10 of their Fantasy Masterworks series. The stories in the collection were originally published in magazine form in the May 1940, August 1940 and April 1941 issues of Unknown, the June 1953 issue of Beyond Fantasy, and the October 1954 issue of Fantasy. A magician also known as a mage, warlock, witch, wizard, enchanter/enchantress, or sorcerer/sorceress, is someone who uses or practices magic derived from supernatural, occult, or arcane sources. Magicians are common figures in works of fantasy, such as fantasy literature and role-playing games, and enjoy a rich history in mythology, legends, fiction, and folklore. The Warlock in Spite of Himself is a science fantasy novel by American author Christopher Stasheff, published in 1969. It is the first book in Warlock of Gramarye series. The title is a play on the title of Molière's Le Médecin malgré lui. The Mathematics of Magic: The Enchanter Stories of L. Sprague de Camp and Fletcher Pratt is an omnibus collection of seven fantasy stories by American science fiction and fantasy authors L. Sprague de Camp and Fletcher Pratt, gathering material previously published in three volumes as The Incomplete Enchanter (1941), The Castle of Iron (1950), and Wall of Serpents (1960) together with additional material from The Enchanter Reborn (1992) and The Exotic Enchanter (1995). It represents an expansion of the earlier omnibuses The Compleat Enchanter, which contained only the material in the first two volumes, and The Complete Compleat Enchanter, which contained only the material in the first three volumes. The expanded version also differs from the previous omnibuses in its selection of supplementary material. The Mathematics of Magic is the first edition of the authors' Harold Shea series to include every one of their contributions to it in one volume. Contributions to the series of other authors from the collections of the 1990s are omitted. Starship Troupers is a science fiction series of novels by American author Christopher Stasheff. It includes three books: A Company Of Stars, We Open On Venus and A Slight Detour. It also occupies the same continuity as Stasheff's Warlock of Gramarye and Rogue Wizard series. Set in the 26th Century, after the human race has established colonies on distant planets and interstellar commerce supports Terra and the Terran Sphere of worlds, the novels follow the establishment and subsequent journeys of The Star Theater Company, the first-ever interstellar theatre troupe. The series title, Starship Troupers, was intended as a play on Robert Heinlein's Starship Troopers novel. Sir Harold of Zodanga is a fantasy novella by American writer L. Sprague de Camp, part of the Harold Shea series he originated in collaboration with Fletcher Pratt and later continued with Christopher Stasheff. It was first published in paperback by Baen Books in de Camp and Stasheff's shared world anthology The Exotic Enchanter (1995). It was later reprinted together with the remainder of the de Camp/Pratt Harold Shea stories in the collection The Mathematics of Magic: The Enchanter Stories of L. Sprague de Camp and Fletcher Pratt (2007). Mixed Magics: Four Tales of Chrestomanci is a collection of four fantasy stories by the British author Diana Wynne Jones, first published by Collins in 2000. One was original to the collection, "Stealer of Souls", a novella about half of the book in length; three had been published in the 1980s. It was the fifth book published among seven Chrestomanci books and the only collection in the series. 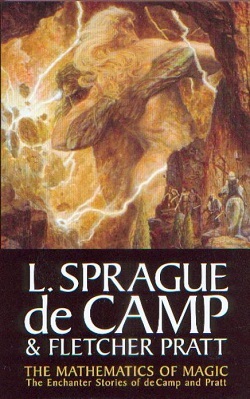 The Wall of Serpents is a fantasy novella by American science fiction and fantasy authors L. Sprague de Camp and Fletcher Pratt. The fourth story in their Harold Shea series, it was first published in the June 1953 issue of the fantasy pulp magazine Fantasy Fiction. It first appeared in book form, together with its sequel, "The Green Magician", in the collection Wall of Serpents, issued in hardcover by Avalon Books in 1960; the book has been reissued by a number of other publishers since. It has also been reprinted in various anthologies and collections, including Great Short Novels of Adult Fantasy I (1972), The Complete Compleat Enchanter (1989), and The Mathematics of Magic: The Enchanter Stories of L. Sprague de Camp and Fletcher Pratt (2007). It has been translated into Italian and German. 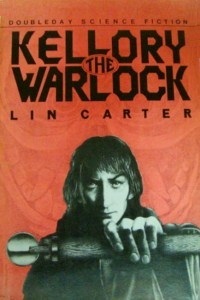 Kellory the Warlock is a fix-up fantasy novel written by Lin Carter, the third book of the Chronicles of Kylix series. Its seven episodic chapters were originally written as short stories, but only one, "In the Valley of Silence," had been previously published. The book was first published in hardcover by Doubleday in April 1984. It was reprinted in hardcover by Wildside Press in 2007.